When the buzz of Christmas has long passed and the January blues set in, people set resolutions to exercise more, eat less, or start a new hobby. Artists are no different. So, why not make January about trying something new? I made my New Year’s resolution to try out the Derwent Lightfast range, which has been on my list of materials to try since their launch. I’ve been using them in ways you might never have tried or even thought of before. Read on to find out the results! Coloured pencils are often associated with realistic and hyper-realistic drawings, much like the fantastic Jesse Lane study that appears on the Lightfast tins. They do lend themselves wonderfully to that, but there’s so much more you can do! Being oil-based, with a medium soft core, the Lightfast range are particularly good pencils for experimental techniques, using blending and solvent, to create painterly effects. The surface you work on makes a big difference to the finished look. A textured paper will give your artwork a different overall finish to a smoother paper. 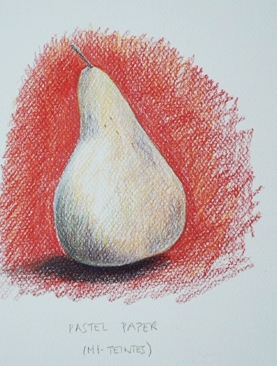 Using a scribble technique on Canson’s Mi-Teintes paper, I drew a pear. 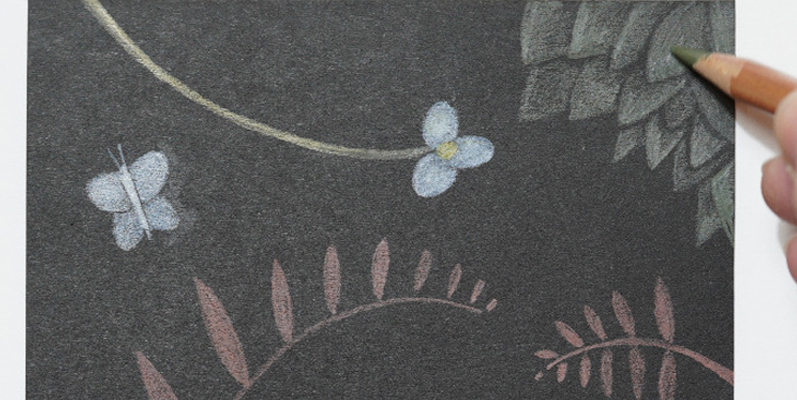 The rough surface of this paper is designed to catch and hold pastel but works well with Lightfast. Traditionally, I’m a big fan of black paper, especially with Derwent’s Drawing range, but I found that the lighter Lightfast colours also performed well on the darker background. For me, apart of course from the 100% lightfast rating across the range, the best positive of this pencil is its unique blending ability, and specifically, how well it blends with solvent. Used on non-absorbent, shiny Yupo paper, when put down dry, the Lightfast range felt and looked like I was laying down markers. Then, when mixed, with solvent, it worked brilliantly on oil painting paper. The pigment activated immediately with the solvent, basically turning into a wash of rich, dense colour that looked just like paint. 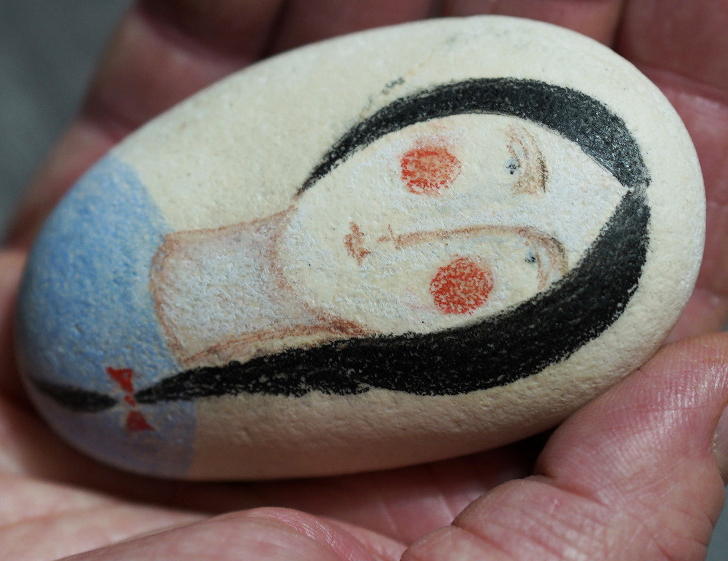 Unexpectedly, I have used Lightfast on wood and to take part in some rock painting, which I usually paint in acrylics. They are amazingly versatile! As well as using mainly coloured pencil and waterbased media in my personal practice, I also work in printmaking, using linocut and monoprint, often making my own stencils and stamps that I also use in my paintings. But could I print with coloured pencil? I wasn’t too optimistic about the results. However, after trying a few times, adjusting the amount of solvent put on the stamp, and discovering it’s best to put the solvent on the stamp first with a brush and then lay down colour using the side of the pencil, I got some really positive results. Printmaking can always be a bit touch and go, in the sense that you never quite know how the print is going to turn out, but that’s part of the fun! With stencils, you have the option to use them underneath the paper (but this has to be quite thin!) and make a rubbing or use them in the traditional sense. I’m sure we all remember doing this as children with crayons! You can work on top of this with solvent and/or successive layers of colour. Alternatively, you can use them as a normal stencil or mask. Firstly, lay down layers of colour. 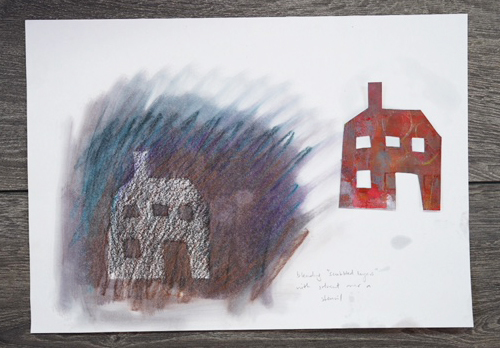 For the purpose of this demonstration, I used a simple, handmade, paper mask of a house, and made quick, densely scribbled layers of pencil on the drawing surface, but you can also do this technique with work rendered in the traditional manner of light, successive layers made using tiny circular marks. Then place your stencil or mask on top, and using cotton wool dipped in solvent (squeeze out any excess solvent so the cotton wool is more damp than soaking!) blend the areas not covered by the mask. Once dry, you can work over with more colour or add detail with a sharpened point if you wish. These are only a few ideas to get you started, but I hope you are now inspired to get out your pencils and try them out in new and different ways, and see what happens!